The Republic of South Africa is an endlessly fascinating land. Its history, culture, people and topography are incredibly diverse and to me, very special. In the mid 17th century, the Dutch East India company established a trading post in South Africa. This post was directly in the "Spice Route" and served and replenished sailors between Europe and Asia. The Dutch contributed their love of meat and desserts, the Dutch's Muslim slaves cooked with delicious spices and slow-cooked methods, the French Hugenots brought with them a passion for wine, the Portguese brought chilis, piri-piri and a way with fish and seafood, the British contributed their pies and puddings, the German settlers brought the craft and love of sausages and the Indian laborers brought their variety of curries and delicacies. What I like most about cooking in South Africa is that the best "regional" dishes represent a very diverse fusion of flavors, often from at least two continents. 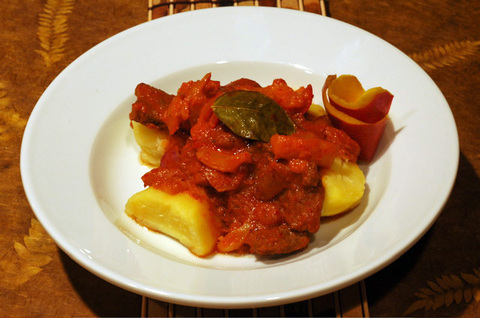 The people have a penchant for that sweet-n-sour combination, but also really have a palate for spices and curries. Many of the best chefs and home cooks in South Africa are still following those bold traditions today. he is licking the bowl. I've adapted and embellished a bit over the past two years, but this credit all goes to Chef Cullingworth. 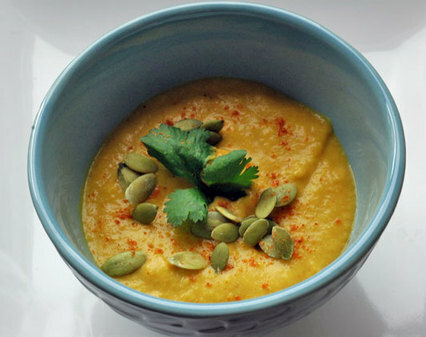 Here is the way I am making the Butternut Squash and Roasted Banana Curried Soup these days. For those of you at last weekend's NYC Food Blogger's party, I tripled this recipe. Melt the other 2 tablespoons butter in a large saucepan on medium-low heat and sweat the onion, celery and carrot for a few minutes until tender and onion is transluscent. Add the garlic, curry powder, coriander, nutmeg and cinnamon and cook slowly for a few more minutes. I was invited last weekend to the home of Danielle and Dave of Habeas Brulee for a New York City food blogger's potluck. It was a terrific opportuntity to meet the passionate cooks and creative minds behind some of the city's culinary musings and terrific ideas. The crowd was diverse and enthusiastic completely into food and trying new things. We all brought things that really helped demonstrate what our blogs and techniques are all about. Sadly, we were so busy eating and enjoying that I didn't get very many shots. Thanks, all, for such a great time! Besides Danielle and Dave, the lineup included Tse Wei from Off the Bone, Julie from A Finger in Every Pie, Stephanie from Adventures of Pie Queen, Lisa from Homesick Texan, Jessica from Su Good Eats, Vanessa from Vanesscipes, and Nicole who blogs about food on livejournal. 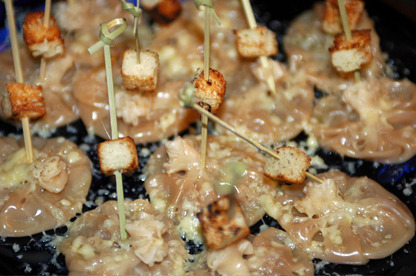 Here are Danielle's French Onion dumplings, complete with cheese and croutons on a skewer! 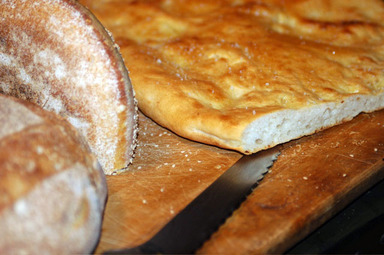 At right is Dave's gorgeous and light focaccia, of course baked on a pizza stone. 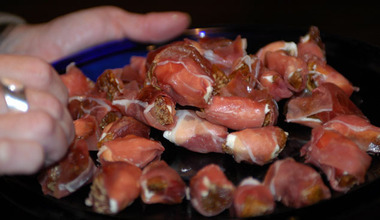 Above are Julie's dates and goat cheese wrapped in creamy parma ham. 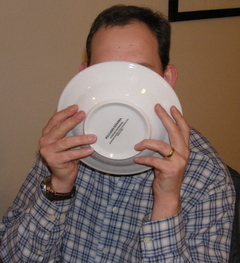 I apologize to all the blogger-cooks who made fantastic dishes I didn't get time to photograph. Somewhere after the dumplings and dates we started just eating the wonderful food and the camera was pushed aside until my appetite was sated. As for me, I made one of our favorite soups here at Scrumptious Street, a terrific butternut squash soup. The soup and the recipe will be one of my next posts so stay tuned. 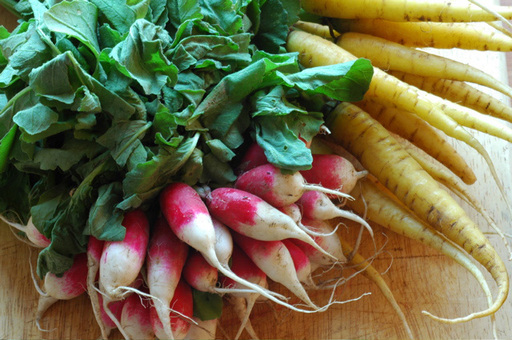 Aren't these yellow carrots and French Breakfast Radishes just beautiful? I love it when produce is so naturally fresh, bright and delicate that you don't want to cook it but you want to make it raw and just barely dress it. Maybe this is a result of the fact that I am the daughter of a farmer's daughter so raw vegetables were very common in my household as a child. I still love eating delicious produce simply by itself or with a little sprinkle of salt or pepper. 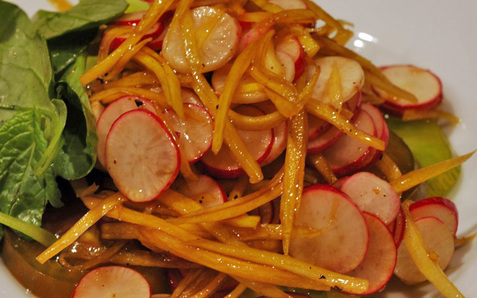 These yellow carrots and French breakfast radishes were so delightful and flavorful, I couldn't do more than simply create a light vinaigrette and treat it as a condiment to the vegetables. They both are much more delicate variations than the regular ones we see in markets, so keep an eye out for them. They are unique and spectacular! Slice the tomatoes and plate. In a bowl, combine the carrots, radishes, olive oil, vinegar, salt and pepper; go sparingly with the olive oil and vinegar, you just want to lightly dress the vegetables to make their natural flavors emerge. Toss lightly and place on top of the heirloom tomatoes on the plate. Garnish with the spicy greens and serve. Mr. Scrumptious asked me after we devoured this wonderful lunchtime sandwich, "you've developed a bit of a sweet tooth, haven't you"? I admit it. He called me out. I do attribute a lot of it to him; his sweet tooth was always much more developed than mine and I've migrated his way. 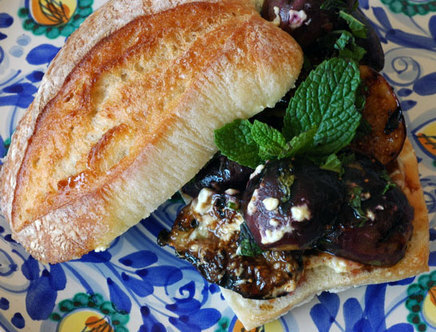 But, just LOOK at this Grilled Fig and Goat Cheese Sandwich. Wash figs and dry with paper towel. Slice in half and put in small bowl. Add the olive oil, balsamic vinegar, mint and kosher salt. Toss together and marinate for at least 15 minutes. Meanwhile, heat grill pan on stove top at medium heat. When pan is hot, slice the rolls and brush each side with olive oil. Place cut side down on grill and leave on for 2-3 minutes to toast the bread. Remove bread and immediately slather both inside halves of bread with the flavored goat cheese. Place figs on hot grill pan, cut side down and grill for 2 minutes. Flip to round side on the pan and grill 2 minutes more. Remove the figs and place directly on the bread, nestling in the goat cheese. Drizzle with just a little fresh honey. Garnish with a little more fresh mint and serve. We found eating these worked best as an open-face sandwich but our rolls were very thick. Enjoy! I make it a point every time I am at the Farmer's Market, to pick at least one item I've never used before and create a dish around it. It is especially fun to mix familiar and unfamiliar so that the final result is welcome like an old friend but updated and new -- like after a class reunion. Recently, after a trip to the market Mr. Scrumptious saw my bounty, which included amazing green beans, and reminded me of one of his family traditions and favorite dishes; curried green beans. 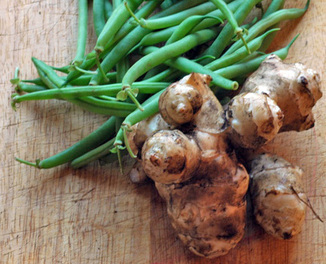 I also had found some beautiful sunchokes (or Jerusalem artichokes) which were an ingredient looking for a dish. So, I used his suggestion to create a spin on it that was both known yet a surprisingly different dish. 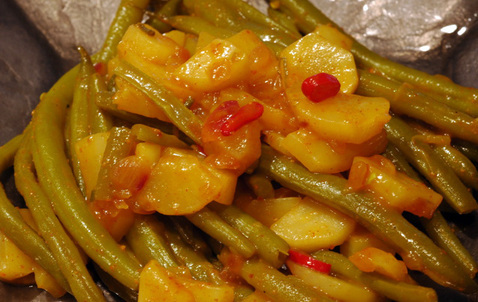 The result was these delicious Curried Green Beans and Sunchokes. While the name of these roots of sunflowers is still somewhat fuzzy and always a topic of debate, their interesting nature is not. I found them to be a wonderful ingredient and will continue to experiment with them. Raw they are starchy, crunchy and somewhere between the taste of a potato and a water chestnut. After cooking, sunchokes absorb the flavors of their preparation and only then display the underlying taste of a well-cooked artichoke heart. They were a terrific addition to the dish, so much so that the beans to me seemed an accent to the sunchokes rather than the other way around. Wash beans, snap off ends and thread. Lay flat to dry on paper towel. Wash sunchokes thoroughly, peel and slice into 1/4 inch pieces. Bring a large pot of water to rolling boil, salt and blanch beans for about 5 minutes until tender yet not soft. Drain and set aside. Combine the cornstarch, curry powder, turmeric and vinegar into a small dish and whisk together to make a smooth liquid. Heat a large skillet with peanut oil and when hot, saute the onions and sunchokes for about 5-7 minutes, until they are turning slightly soft and releasing the onions' aroma. Add the spices/vinegar liquid and stir thoroughly in the skillet to incorporate evenly with the onions and chokes. Add the green beans, sugar and minced chili and mix completely. Add the water and reduce the heat, simmering the veggies another 4-6 minutes until the sauce has thickened and is rich and tasty. Remove and serve vegetables immediately. The beans and chokes were fantastic, the dish was a luscious curry flavor, just shy of hot but packed with smoky spiciness. The sunchokes absorbed the spices beautifully, and the combination of the creamy cooked artichoke flavor with the curry was exquisite. A big hit, this one. 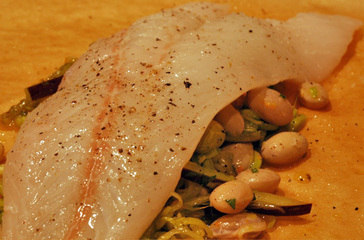 One of my favorite preparations for fish is to bake it in parchment paper following the method called "en papillote". I learned this in a Techniques of Fish course I took a couple of years ago at the Institute of Culinary Education here in New York. The fish is usually on a mound of vegetables and some kind of liquid and then tightly wrapped up in the paper to make a self-contained pouch. The liquid may vary, but juice, wine, stock, liqueurs or aperitifs are all good choices. The fish is steamed within the paper so unless you really mess up the temperature or time, it's always very moist and tender. There are endless ingredients and combinations with this method and once I became comfortable with it, I started really experimenting beyond the recipes I learned in class. The most important aspects to remember are that you're steaming instead of baking and therefore, you should take care to use many interesting flavors and herbs that will produce natural juices in addition to the liquid that you add. The fish will take on the flavor of what you steam it with so make sure it's not bland! Practice in making the packet seal well is important too so if you've ever crimped pie dough it'll help you get it right. I didn't take the time to take enough photos of the packaging steps, that's where I needed a photographic assistant. This link shows the basic steps. If you have questions please comment on this post and I'll explain to everyone. I prefer delicate, usually white fish en papillote; good choices are halibut, sea bass, sole and in this case orange roughy. 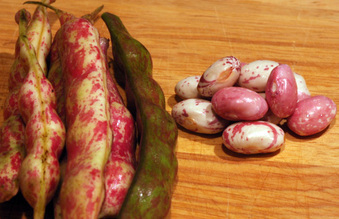 I also built the idea and recipe around gorgeous cranberry beans from one of my market hunts. I blanched the beans first after tasting them raw-- very starchy, thick and bitter like a lima bean. When they were blanched they had a more mushy texture, lost their vibrant pink and started to develop a nutty flavor. 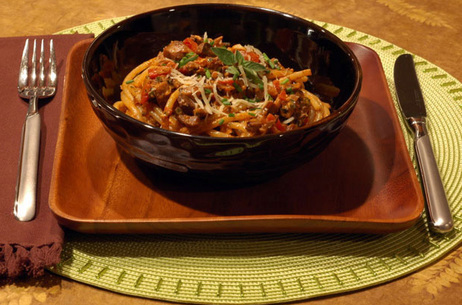 I worked into the vegetable mixed from there, coming up with something that turned out quite delicious and balanced. Here's the recipe to serve 4. Preheat oven to 400 degrees Farenheit. Place a baking sheet in oven. Shell cranberry beans by removing from their pods, rinse well. Bring a small pot of water to boiling, salt generously and add the beans to the water and blanch for 6-7 minutes until you test a bean and it's lost the raw flavor and is beginning to have a firm but yielding texture. Drain and let cool. In a medium bowl, combine the bell peppers, leeks, orange zest, lime zest, sea salt, pepper, olive oil and tarragon. Mix gently with your hands. 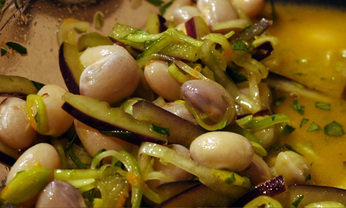 When cranberry beans have finished and cooled, add them to the vegetables and let marinate for at least 15 minutes. When oven is pre-heated, pull out four separate sheets of parchment paper that are large enough to encase one fillet when the paper is folded in half. Cut each sheet into a large heart shape fold in half. Open the fold (it should now look like a valentine's heart) and brush the inside of the parchment paper with olive oil using a pastry brush. Spread the vegetable mixture lengthwise near the fold in the paper, to match the size and length of the fillet. 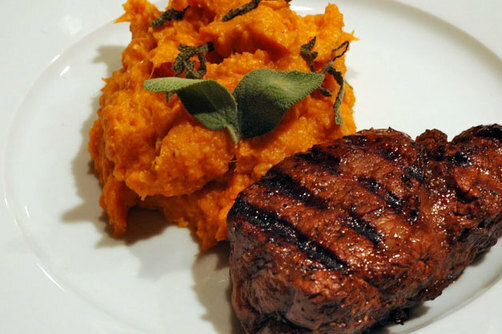 Lay a fillet on top of the vegetables, sprinkle with 1/2 tablespoon white wine for each fillet. Season with sea salt and ground pepper. Cut four small pats of butter and place them on top of the fillet. Close the other half of the heart on top of the fish and vegetables. 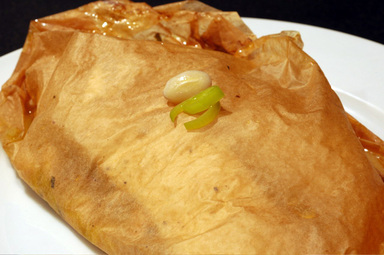 Begin at the top or base of the heart and roll, fold and crimp around all the edges and seal the packet as you go along. Remove packages from oven when done and serve immediately. It is traditional to take them to the table still in paper. Encourage the diners to make a small x in the top of the package to let the steam escape before cutting the paper completely open to reveal the fish inside. The cranberry beans became absolutely delicious when prepared this way. They were nutty, robust and lost all mushiness but become softer with still a nice mouth feel. Think al dente pasta...it was a wonderful combination of moist, flaky fish, soft but al dente beans and cooked but crispy peppers. Interesting and unique, it definitely was a hit with my guests too. Tomatoes are fruit not vegetables! Finding local treasures has been so much fun recently and this week gave me the opportunity to invent a salad with two fruits I've never used before. I called it "Mars Grape and Husk Tomato Salad with Amazing Goat Cheese Dressing". 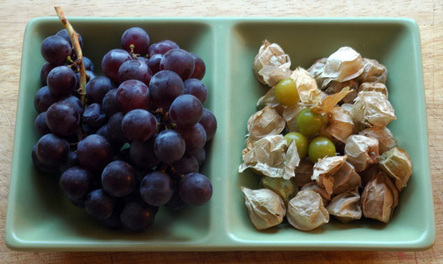 The font of inspiration were blue seedless grapes and ground cherries, a variety of husk tomatoes. I had never seen these, but they reminded me so much of tomatillos that I had to research, only to discover that they are indeed related, of the same species, Physalis. They are small and delicate, covered in a papery husk that easily slips back and reveals the fruit inside. They reminded Mr. Scrumptious of a berry that grows in the land from which he hails and with a little more research, I found indeed these are also related to cape gooseberries but with a little different flavor. The main flavor is like a tart, punchy, vibrant fruit. In the ripest yellow ones you can taste a hint of pineapple. These ground cherries really are only reminiscent of a tomato by the flavor of their skin, which is just a slight lingering hint on the finish of the bite. To me, they are still totally misnamed; neither tomatoes nor cherries does it. They're most like, well, berries. At the market I had no idea what I would do with these, but as I shopped I later found gorgeous Mars blue seedless grapes and the salad began to form in my mind as I popped both in my mouth at once to taste the combination. Tart, with juicy tones and very complementary sweet edges, these fruit were made for each other. 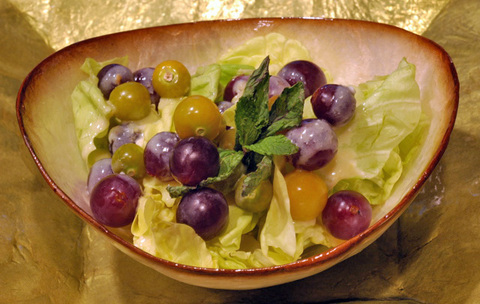 At home with my lovely fruit, I created a salad that really showed off the tomatoes and grapes and the symbiotic flavors between them. Key to the recipe is goat cheese that I also found at the market from Lynnhaven farms in Pine Bush, NY. I bought the honey, orange and walnut goat cheese. If you can't find this combination already mixed up, I'm sure one could easily make it by whipping together the base ingredients. It is that simple. And yes, the cheese is scrumptious (like the Lynnhaven link says if you read it...) It looks like you can even buy Lynnhaven's famous goats if you really want to make it from scratch! Wash and dry the lettuce and grapes. Lay flat on a towel to dry. Remove the tomatoes from their husks by pinching open the husk on one end. Lightly wash them and lay flat to dry. Make the dressing by putting the goat cheese in a small bowl and breaking it up with a fork. Halve the orange and squeeze into the bowl, catching all seeds. 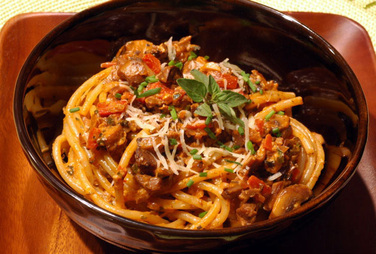 Whisk together until cheese is thick and creamy with small chunks. Slowly drizzle in the hazelnut oil and whisk thoroughly. Add the honey and salt and whisk again until smooth and light. Tear the lettuce and place on salad plates or bowls. Sprinkle the grape and husk tomatoes on the lettuce. Spoon the dressing on top and garnish with mint leaves.